Hardware, lighting and decorative elements are the jewelry of a home. Trained in the arts of glass blowing, stained glass design, Japanese flower arranging and jewelry design, Nina brings a unique aesthetic to all materials selected. She designs her houses so everything fits together to create a unique whole- whether it is the fireplace surround, stairway, lighting accents or cabinetry, it all works to form a cohesive whole package. The Fireplace is the heart of this home with built in storage for audio. Dramatic Staircase with Stainless Guardrails. The Fir beams and ceiling lend a warm contrast to the stone. 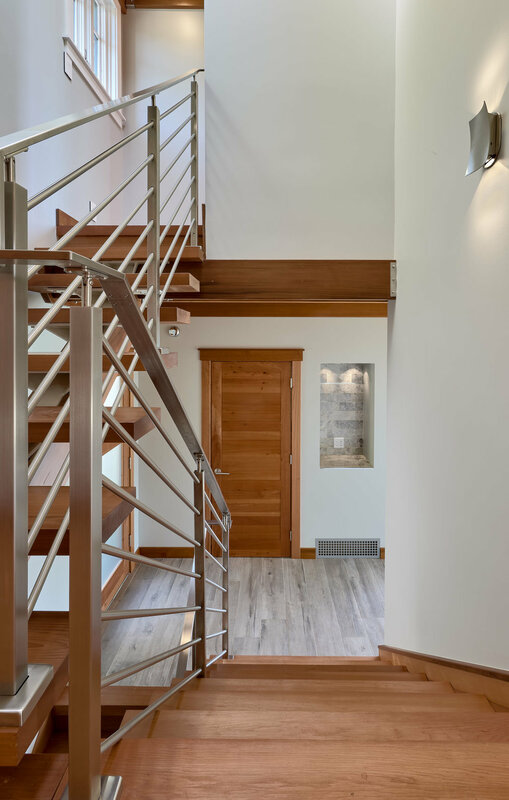 From the entry, the upper staircase treads float on a wood beam.